In my previous article, I wrote about how I was still a Marvel zombie in the aughts. I wrote about Civil War and Planet Hulk. New (maybe just to me) writers and artists were mentioned. Oh heck, you know what? If you want to know, just read the article. I have a tradition on the page to transition from Marvel to DC to Independent. Most times, that independent is just Image. In any case, the last article was Marvel. This one has to be DC. Without tradition, what are we? To be perfectly honest, the 2000s are when I discovered that DC had more than just Batman and Superman as heroes. Many of the heroes still didn’t speak to me on more than a superficial level, but at least I learned their names. It’s always awkward when you can’t remember a name. The 2000s might have been the decade that introduced me to the DC heroes other than Batman and Supeman. However, y choice of these titles did not reflect that. Honestly, I don’t know if there were other All-Star DC titles. I could Google it, but I’m trying to be intellectually honest here. In that spirit, I saw Grant Morrison on the Superman title and Frank Miller (Maybe? 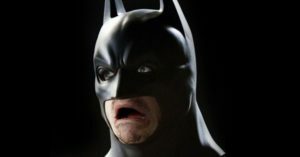 Again, verifiable, but I’m almost positive it was him on Batman and got tunnel vision. If there were other All-Star titles, I missed. them. Well, I didn’t miss them, so to speak. I might not have read them and I can’t say what I missed. But, I can say confidently that I didn’t miss them. Got it? Probably not. 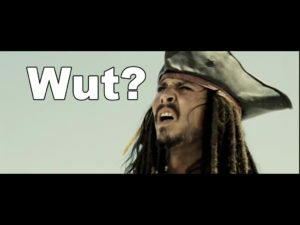 Even reading that back now, it is quite confusing. So, I will try to clarify. If there were other All-Star titles, I neither read nor bought them. In that context, I missed them. 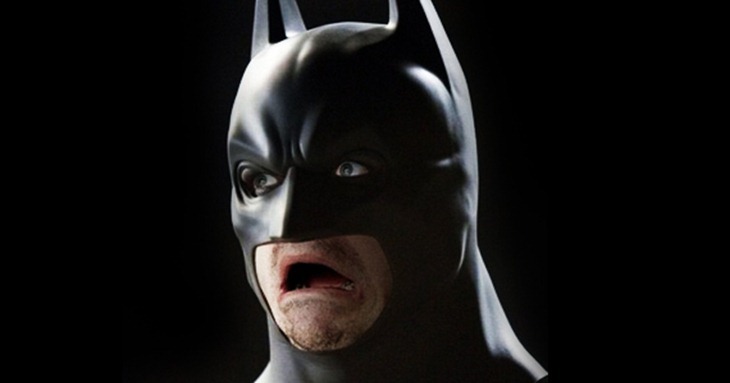 However, I enjoyed both All-Star Batman and Superman so much that I didn’t feel left out of the loop in any way. Unlike other books where I feel bad not collecting them regularly, I don’t have any desire to own other All-Star books. If they even exist. Okay, now maybe I over explained it. The struggle of an educator. Moving on. Why am I talking about comics I never collected? Comics that maybe never existed? Two comics that definitely existed and I willing collected and read were All-Star Batman and Superman. I already mentioned what initially attracted me to the books. Let me explain what kept me reading. I hate Superman. 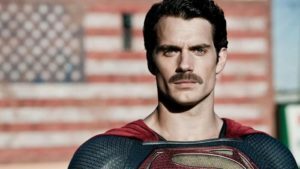 This is not some newly found hipster hate in reaction to the new movie Superman. I have always hated Superman. He’s too…for lack of a better term, vanilla. I like my heroes to have a bit of an edge. Grant Morrison didn’t necessarily give him that edge. But, he made the vanilla into a slightly more exotic vanilla. Not quite French Vanilla. Closer to vanilla bean. Plus, the art is gorgeous. Like everyone else, though, I had a visceral negative reaction to this mustache. Batman was a no brainer. Whenever you can read Frank Miller writing Batman, you do. I’m convinced now that Frank Miller wrote the title. No Googling necessary! Take that, millenials! Jim Lee, did the art. Okay, DC Comics, fine, just shut up and take my money! Naturally, the book was amazing. As an added bonus, Robin joined Batman. Many writers want to kill Robin off as quickly as possible. Seeing Miller embrace Robin and DC including him in the title was encouraging. While I perused the shelves looking for the latest Civil War tie-in titles, I noticed that DC planned their own event. I knew nothing about the previous crisis event. However, I found their idea of a weekly title intriguing. I lasted through the entire countdown and ten or so of the “Week” titles before bailing. This is the periodic reminder that my separation from comic books this time was due to my bass-ackwards town charging so much for rent that they put my local comic store out of business. Also, I didn’t have the inspiration to drive for comics or the knowledge of mail order places. I’m regretting that now that I’ve gotten the idea to collect back from Rebirth to the Crisis. Chris tole me that some of the New 52 titles might be tough to collect. I might have to fill in with some trades. That hurts my collector soul. But, it might be worth it. I’ve heard some things about New 52 that make me hesitate. But, I will talk about that in the next section. I am quite interested in seeing how the Crisis happened and led to Rebirth. Spoiler Alert: Whenever DC Comics want to reboot the universe, they have Flash go back in time and it breaks the timeline. I know that the Crisis led to New 52. 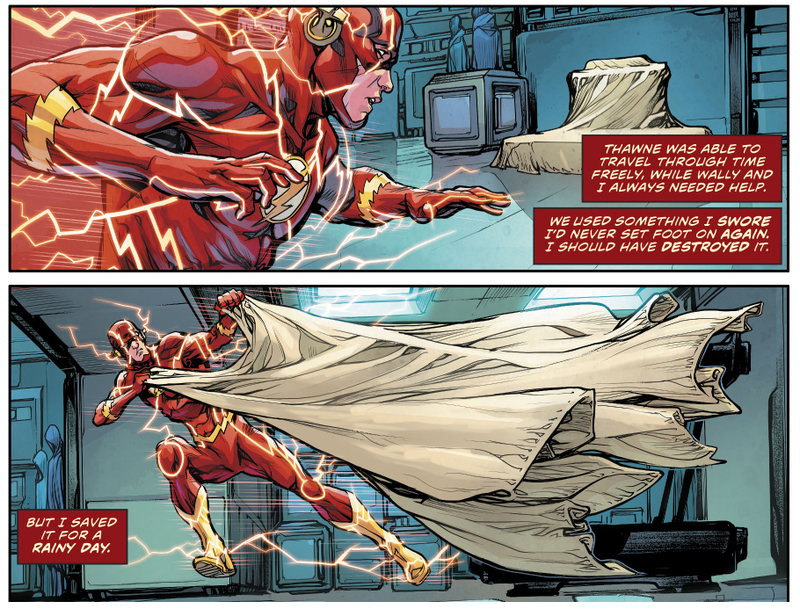 Several times during New 52, Chris tried to convince me to pick up a couple of the books. He especially enjoyed Batman and Swamp Thing. I got neither of those titles, nor any of the other New 52. Since then, the latter decision has been validated because I’ve heard that the New 52 tried to fundamentally change DC titles. Look, those who have read my articles know that I’m not a strict traditionalist. I do have traditionalist tendencies. At first, I wasn’t sure about female Thor. What sold me on it was that it pissed off the rest of the comic book community in a big way. Therefore my counter culture identity might allow me to enjoy New 52 if I gave it a chance. Because I most definitely enjoyed what I read from DC in the 2000s. While intrigued by the concept of a weekly series, I did wonder if they could keep it engaging and entertaining. 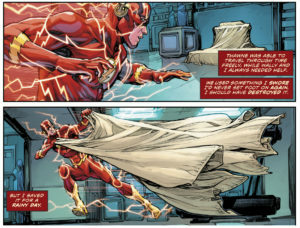 I’d like to see where the series ended up and also how they arrived at the craziness of New 52. Besides, what else am I going to do with my newly found windfall by using DCBS instead of Midtown for my pull list titles? Promised for a week or so and finally recorded, Chris and I talked about 1990s comics. I already did three articles on Marvel, DC, and Image comics in the 1990s. But, I like to make sure that the articles match what is on the podcast for that week. Therefore, I have to keep writing about comic books this week. 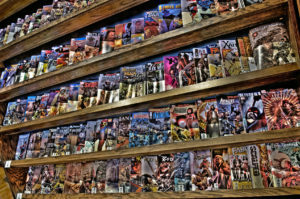 In keeping with my previous theme of reminiscing about my time in Magic the Gathering, I figured I can keep talking about my recent history with comic books. The 1990s are when I discovered comics. The 2000s are when I rediscovered comics. I found a local comic store in the neighboring town of Athol. Due to rent concerns and low profit margins on comics, he moved the store to Orange. It was right down the street from my house. Instead of having to drive 5 minutes, I only had to walk 5 minutes. It didn’t hurt that the guy was friendly and would talk to me every time I was in the store. Also, it was just a great time to get back into comic books. It was wonderful. Then, of course, my backwards town somehow screwed it up and the guy closed shop permanently. I went into great detail in my Marvel Comics in the 1990s article about how pop culture was instrumental in shaping my comic book interests. While my interests were mostly cemented by the time I rediscovered comics in the 2000s, it was the time that comic book movies started to grow up. We were still a couple of years away from the birth of the current golden age of the MCU, but something big happened in the early 2000s. Marvel Comics took a bit of a risk. They released a new Spider-Man movie. Even though it doesn’t seem like it now, I say that they took a risk. Historically comic book movies were terrible. Even as they figured things out in those early days, there was still a clunker every now and then. 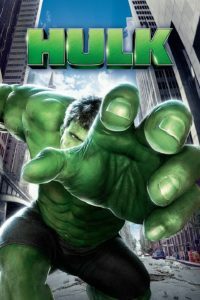 While I didn’t mind it, the first Hulk got mostly negative reception and it took them a while to find a Hulk that worked on the big screen. Spider-Man was the first comic movie experience that was positive. Somehow, I convinced my wife (who is not a comic book fan at all) to come see the movie with me. I also convinced her to see the re-released Star Wars movie. While it took her until Episode 7 and Rey to truly embrace Star Wars, she was on board with Spider-Man from the beginning. Granted, things got weird at the end when they tried to do Spider-Man No More and Venom in the same movie, but I think we can all agree that they’ve figured things out. You are probably wondering why I’m not including Civil War in my discussion. It is the defining event of the decade and it might be (since the movie) one of the most recognizable crossover events in comics. Sure, Infinity War has recently surpassed it. When Captain America Civil War released into the theaters, though, it got my formerly comics deficient friend to start talking about comics and he is willing to discuss the movies with me if not the books. 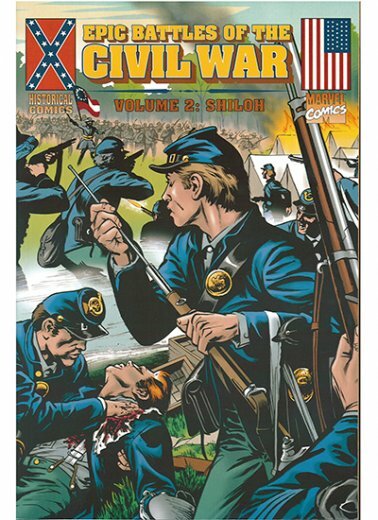 He’s a history guy, though, so this might have been his idea of comic book civil war. Because it was so influential, I’m going to give it a separate section for discussion. Why Planet Hulk? 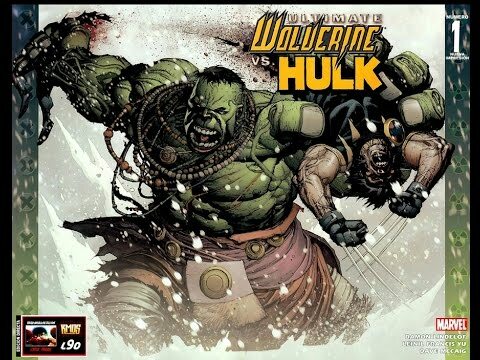 Even though it isn’t as influential outside of the comic book world, I prefer Planet Hulk to Civil War. Therefore, it gets its own section. Other than those two events, Marvel had a pretty good run during the decade. Books that I continued to collect after the events were over include Cable and Deadpool and Thunderbolts. Warren Ellis wrote Thunderbolts. He gained a fan for life with his depiction of the dysfunctional super villain team. In fact, I started my Warren Ellis collection with his series New Universal. Perhaps the most interesting thing Marvel comics did during the decade was the Ultimate line. 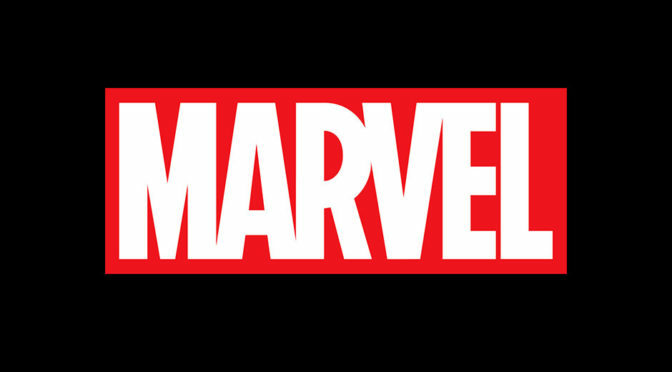 It reinvented the Marvel comics universe to possibly new fans. Familiar faces acted in unfamiliar ways. It didn’t always work. Weirdly, Hulk was a cannibal. Often, it did. Ultimate Fantastic Four introduced the Marvel zombies. Sometimes it reminded me of the “good old days”. I experienced one of the most frustrating release delays since the days of Image. I’m looking at you Ultimate Wolverine vs. Hulk. You don’t rip a man in half and then delay the next issue indefinitely. 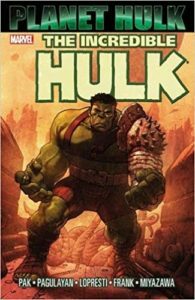 I don’t know what the reaction to Planet Hulk was from most comic book fans. I do know that it hasn’t been turned into a movie. Oh, sure, there was the animated movie. Also, it was given a minor treatment in Thor: Ragnarok. We have yet to see Planet Hulk staring Mark Ruffalo. It’s too bad, too, because the Hulk in Ragnarok was so much fun and I’d love to see a movie starring him. My only request is that Greg Pak is consulted if the movie is green lit. Initially, I didn’t pay attention to writers and artists. I knew names from my previous experience with comic books. But, the fallout from the creation of Image comics brought an influx of new talent. One of the new writers that I would come to enjoy (and ultimately admire due to his Twitter feed) is Greg Pak. Planet Hulk is pretty much the whole reason I’m a Greg Pak fan. I’ve always been a fan of the Hulk. I enjoy the Jeckyll and Hyde nature of the character. It intrigues me that Marvel made their heroes more human with potential human issues. Hulk explores the psychological terror of multiple personalities with respect. Sure, as with all comics, they lose their way and go off the rails sometimes. Mostly, though, the Hulk struggle is one worth following. This story dealt less with that because Hulk was the dominant personality. But, seeing Hulk finally get his wish of “wanting to be alone” initially. Then, he became the leader of the rag tag group of gladiators. Finally, he fulfilled his destiny as the Worldbreaker. It is probably one of the most fun Hulk stories ever. 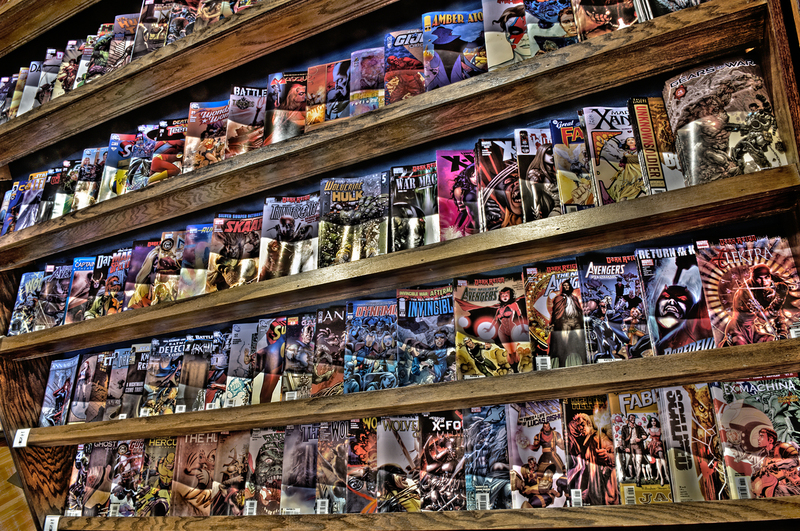 When I was in the comic book store looking for books, I noticed a banner in the corner of the Marvel comics. It said, “Whose side are you on?” There might have even been the Civil War logo. But, there was definitely a date when the event was scheduled to start. 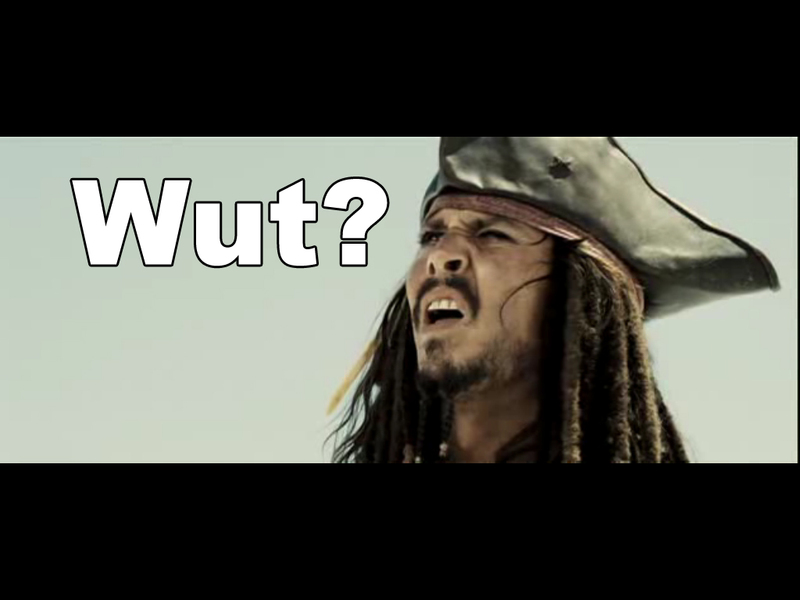 Instead of guessing, I just went searching through my books for an example, but I can’t find one. 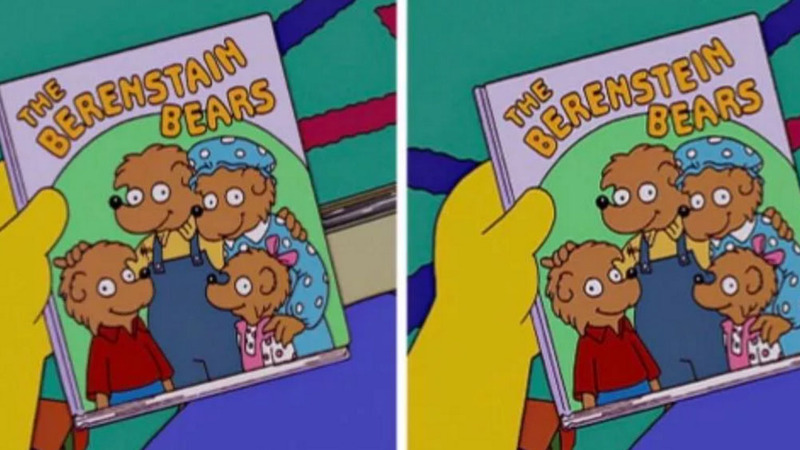 I hope this isn’t one of those Mandela effect things. In any case, I went home to research Marvel Civil War. I learned that it was going to be a huge crossover event that was going to sucker me into buying 25-30 books a month for the duration. Okay, maybe I’m exaggerating a bit. Some of them even became a part of my regular collection. Most of the titles, though, I just bought for the event. Even so, it was all worth it. I wasn’t around for Inifinity War. I do understand that it was probably the most ambitious crossover event of the time and maybe in history at that time. So, I can understand the nostalgia that people have for the event and why all others are compared to it. I might go back and read it sometime to see if it lives up to the hype. As Civil War was my first mega crossover event, I will compare all future events to that one. If you look back on my Secret Empire review articles, I mention Civil War more than once. It was a well crafted story that dealt with current events. Some people have recently decried the inclusion of politics into their comics, but that’s usually just a deflection because they don’t agree with the politics. While Secret Empire felt a bit too real for me and I had to take a break, I never had that problem with Civil War. Probably just too young and dumb. I discovered comics during the 1990s. I fell in love with them during the 2000s. Marvel went a long way to making sure that love stayed true. I will talk about my experiences with DC and Image, of course, but what kept me going back to the comic book store (that was only a 5 minute walk away, I stress) were Civil War and Planet Hulk. 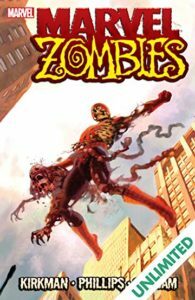 Marvel Zombies were cool for a while, too. I’m not sure why I wasn’t on board with them beyond the first title. Zombie fatigue, probably. So, when I say that I’m a lifelong Marvel zombie, that’s not entirely true. Traditionally, I do like the Marvel characters better than the DC characters. Also, the last two times that I’ve gotten back into comics have been because of Marvel events. My sentiment is changing some recently because I prefer DC to Marvel right now. However, in the 1990s and 2000s, you could make mine Marvel.